LATEST UPDATE dated 26.02.2019 : Official Cut Off Marks for UPSSSC Yuva Kalyan Adhikari Written Exam is available Now. Check Vikas Dal Adhikari Official Cut Off below…. UPPSC has increased Vacancies for Yuva Kalyan Adhikari & Vyayam Prakshikshak Posts. Now Selection will be done on 728 Posts. Download Official Notification regarding Vacancy Increment from given link…. UPSSSC Yuva Kalyan Adhikari Result can be announced Next month. Candidates will be called for Physical test in Ratio with Vacancies. Read full news from Image below…. Sammilit Vyayam Parshikshak Evam Kshetriya Yuva Kalayan Evam Pradeshik Vikas Dal Adhikari Exam 2018 Advt. No. 01-Exam/ 2018 Uttar Pradesh Subordinate Services Selection Commission has conducted awaited Written Exam for Yuva Kalyan Adhikari Post. This Exam was conducted for 694 Posts. UPSSSC has earlier invited 694 Vacancies for Regional Youth Development Officer & Vikas Dal Adhikari and 42 Vacancies for Training Officer. After Screening of Application Form, UPSSSC has conducted Written Exam for Yuva Kalyan Adhikari Posts on 16th September, 2018. Information regarding upsssc yuva kalyan adhikari result 2018 is provided here. Some Stats about Exam : This Yuva Kalyan Adhikari Exam was conducted for 694 Posts. Total 3,37,595 Candidates has applied for these posts. Exam was conducted at Gorakhpur, Varanasi, Allahabad, Lucknow, Kanpur Nagar, Agra, Bareilly, Meerut & Muzaffarnagar. Exam was conducted in two shifts. In 1st Shift 168699 Candidates appeared while in 2nd shift 168696 Candidates appeared. Exam was conducted at 266 Centres all over Uttar Pradesh. Total 2.30 lac Candidates appeared in UPSSSC Yuva Kalyan Adhikari Exam 2018. 1.07 Lac Candidates were absent in Exam. UPSSSC will announce Written Exam Result of Yuva Kalyan Adhikari/ Training Officer Exam. Result will announce based on Marks of Written Exam. As well as UPSSSC will also upload List of Successful Candidates for Physical Test. Candidates will be able to check Result displayed on official website of UPSSSC (http://upsssc.gov.in/). About UPSSSC Yuva Kalyan Adhikari Exam: Exam was conducted under Offline Mode on OMR Sheets.There were 200 Questions in Exam comprising of 400 Marks. There was Negative Marking of 1/2 Marks in UP Yuva Kalyan Adhikari Exam 2018. Time Duration of Exam was 2 Hours (120 Minutes). Written Exam was of Intermediate Level. UPSSSC yuva Kalyan Adhikari cut off will be decided from 400 Marks. UPSSSC Yuva Kalyan Adhikari Exam After Result Process : Selection to the Yuva Kalyan/ Vikas Dal Adhikari & will be based on Written Exam & Physical test. Final Selection may based on merit of Written Exam. 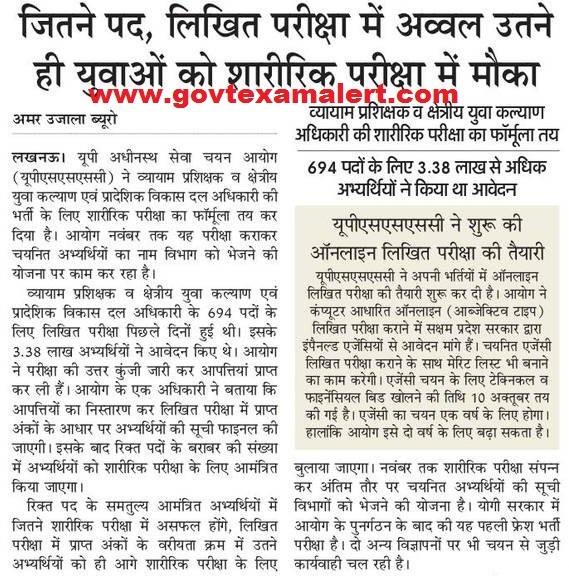 UPSSSC will conduct Written Exam First to Shortlist candidates for Next Process. List of Qualified Candidates for Written Exam will be available on Official Website. Aspirants need to have a regular watch on UPSSSC Website for upsssc yuva kalyan adhikari result 2018 Latest News Updates will also available on www.govtexamalert.com. So Bookmark this Page (Press CTRL+D) & get regular UPSSSC Recruitment, Exam News, result Updates. Kis base pe result out kiya gaya h. jitni post utne ko hi bulaya gaya h. Ya aage bhi bulaya jayega? Koi ek cutoff sunischit Kare Bewajah abhyarthiyon ko paresan na Kare. Check Official Cut off from this link..
jitne exam ho rahe hai sabka ruselt a raha hai eska kya nahi aa raha hai? kab tak aayega please bataye. 16 sep 2018 ka exam ka result kab announce hoga. yuva kalyan adikari ka result kab declare hoga koi date fix hui kya? Can’t u see how many childrens are waiting for the result. Why u not declare the result ? Agr result nikalna nhi tha to exam kyu liye?